Coffee is certainly one of the most well-known and preferred beverages in the world. It is ideal for entertaining guests or family at home. As well, it is an excellent drink that you can relish throughout the day. And as a coffee connoisseur, there is nothing better than a fresh cup of espresso. Even better, instead of going out to a barista for a cup of Jo, you can savor a perfect cup at home. And when it comes to espresso machines, there are numerous top quality devices to fit your needs. • Piston or lever driven which is operated by hand and is the most preferred. This is because it preserves the whole flavor of the coffee bean. Operation is simple with little coffee residue. • Pump driven is the most common espresso machine. It ideally mixes the combination of steam, air and milk to produce ample froth. As well, the flavor stays strong while the foam is maintained. Basically there are three types of automation; semi-automatic, automatic and super-automatic. • Semi-automatic devices offer more control for the user. This is a good choice for exceptional connoisseur since control over the shot greatly affects the coffee quality. • Automatic machines allow the user to select the amount of time for brewing. This is a good option since you do not need to stand and wait for the coffee to be done. • Super-automatic devises are super easy to operate. This is the least preferred for the ultimate coffee aficionado but it is the most preferred for the person who likes a good cup of Jo but is not exceptionally picky. 3. Pressure is very important when it comes to selecting an espresso machine. Generally, a machine that has 15 bars of pressure is a good choice. For comparison, piston-driven machines only need 10 bars of pressure or less whereas pump-driven types require 15 bars of pressure or more. 4. Water quantity is very important. Too little or too much water will actually affect the flavor your coffee. Most coffee enthusiasts believe that 32 ounces is the ideal amount. However, every espresso maker is different. As well, always start with cold water. The Breville BES870XL is a semi-automatic that has the best price for the value. Compared to older Breville models, the device has many new features including an integrated burr grinder for full flavor. In addition, the device extracts full flavor from the bean at a remarkable speed (less than one minute). This espresso machine is a great device for both the novice and experienced. It is easy to use and delivers full flavor in a short time. There are two pressurized filters with dual-walls that help regulate pressure. There are also non-pressurized filters with two single-walls for prime extraction. And with an Italian made thermocoil heating system and 15 bar pump, the device offers the ultimate espresso. Plus, the price is right. This simple to use and compact espresso machine has a 15 bar pump with an affordable price. It is the ideal device for people who are switching from drip coffee to a stronger more favorable brew. It features dual thermostats, an easy to maintain stainless steel broiler, an adjustable frother and other qualities. If you are looking for full flavor, this device is best with darker roasts. Moreover, its small compact size packs a punch without the high price. The Gaggia 14101 features an impressive 17 ½ bar pump plus a high voltage boiler. Renowned for its commercial grade construction, this device is housed with quality stainless steel. And for temperature stability, it has a grouphead and portafilters made of top grade brass with chrome plating. As well, it comes with a three-way solenoid valve and an independent expansion for instantaneous pressure release. This easy to use espresso maker is great for the beginner. It has a very reasonable price and with more than the average amount of quality. If you love froth, this is the machine for you! The device also has numerous qualities. In fact, you may need to run a few trials in order to get the perfect espresso to suit your tastes. Features include a 15 bar Italian pump, a 1600W thermo coil heating system, auto adjust for optimum espresso extraction plus a conical burr grinder with one half pound sealed bean hopper. Moreover, the device has a streamline design with extra accessories. In truth, the Breville BES840XL Infuser is a robust luxury machine with an affordable price. This is a compact device with a compact price tag. In addition, the DeLonghi ESAM3300 Magnifica is bursting with plenty of power. Comprised of a world wind of features such as a digital control panel with settings that are programmable, less refilling with a 7 1/2 cup (60 ounce) water reservoir, a built-in burr grinder and a one-touch foam method for the perfect froth. In addition, it has self-cleaning powers that make it a breeze to clean. Moreover, the price can fit most any budget. A little less expensive and sophisticated than the Citiz model, but it is ideal for a fast and simple beverage. Although it does not have a milk frother, it is equipped with a 19-bar pressure pump that ensures maximum extraction of flavor. As well, it heats to the ideal brewing temperature in about 25 seconds. For simple preparation, brewing is completely automatic plus you can select the size the cup size. As well, the drip tray folds up so you can accommodate larger mugs or glasses. And for convenience, there is an easy to fill removable water tank. The compact Nespresso Inissia Automatic Espresso Maker is perfect for small areas like dorm rooms, tiny kitchens or an office. This is one of the most economical espresso makers on the market. The Mr. Coffee Cafe Espresso comes with an array of features that offers professional results. It is a one-touch operation that brews the perfect cup by utilizing a 15-bar pump system. In addition, it has an automatic frother so you can create the perfect lattes r cappuccinos. Simply select from a single or double shot filter, the preferred ground, fill the reservoir with milk then choose your brew. This easy to use espresso maker is perfect for beginners. It also comes with a recipe book for creating a variety of coffee drinks. This machine is about as easy as it gets. It has programmable buttons for both lungo and espresso. As well, it brews in a hurry in about 25 seconds. And for safety, there is an auto shut off to keep you and the device protected. And for convenience, there is a 24 ounce water tank, The device features two pre-set cup settings with a 19 bar pressure pump and thermoblock heating unit for the perfect cup of Joe. The Rancilio Silvia Espresso Machine is a well-designed device that is highly attractive and functional. It is very durable and has numerous commercial-grade components. As well, it is Eco friendly with a small footprint. Although there is a small learning curve to get optimum results, it offers the ideal combo of espresso quality, durability and user friendly features. In fact, many consumers say that it is the best espresso machine available for less than $1,000. This semi-automatic espresso machine provides exceptional espresso and extreme durability. What is more, many coffee connoisseurs recommend purchasing a high-quality burr coffee grinder to accommodate this supreme espresso maker. This fully automatic device has some spectacular features that live up to its reputation of passion, precision and perfection. It has a innovative compact thermoblock system with a mighty 15 bar high pressure pump. And with the conical burr grinder that comes with an adjustable coffee grind size, you can fix the perfect cup. In addition, there is a color touch screen so you can easily customize your preferred beverage. 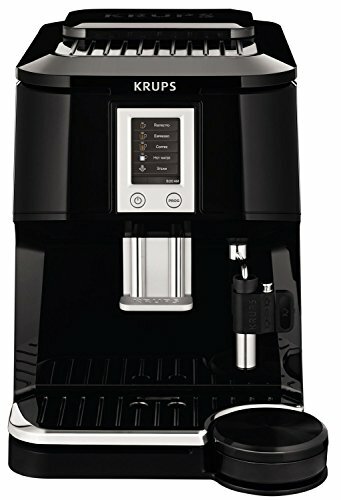 What is more, the KRUPS Falcon is equipped with an adjustable coffee outlet for different cup sizes, an auto on and off, a water tank with an integrated handle and a removable coffee ground collector.